Why didn’t you tell me this darn dog was going to be so good! 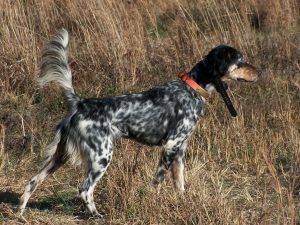 I was skeptical for years of owning a pointer because of all the stories I had heard about how hard-headed they were, but your pointers handle like a dream and are determined to please you. 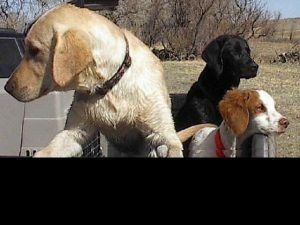 They are very natural and have an intense desire to retrieve. Hope everything is going well. I just wanted you to know that the pup I got from you has just finished his first season. 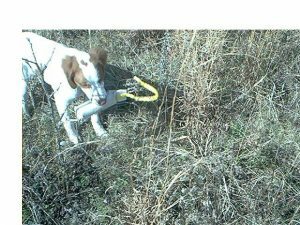 He has surprised everyone who has seen him hunt at what he can do for a 1 year old pup. I wanted to drop you this note on the pup I got from you in May 2007. 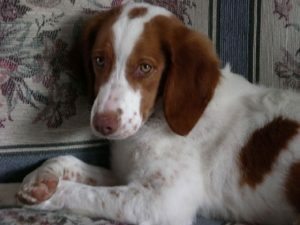 We named him Pete and he is a very nice Llewellin Setter. 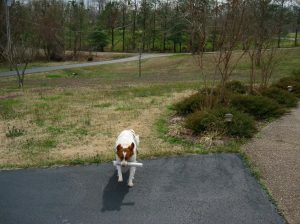 I trained him a little and relied on his natural instincts. 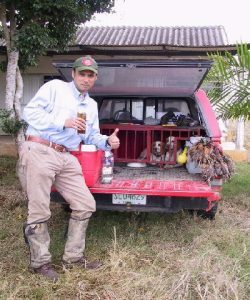 I can’t stress enough to the people who purchase pups from you that they must find a source of live birds and a place to train them, even just if with a bird launcher/cap gun. 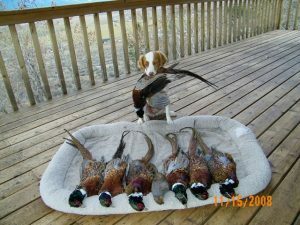 The result is that Pete has been an awesome hunter, using the instincts you bred him for, to hunt very well. 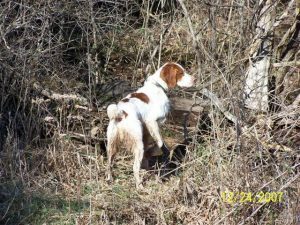 I’m still on the hunt with him in Kansas for Pheasant that was his first exposure to wild birds. The Roosters have run, and he has learned to adapt, and signal me. 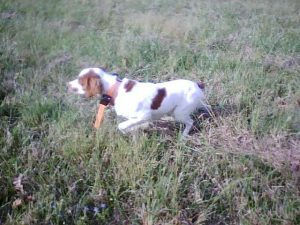 I can then send him on and he will rush forward and find the bird again and re-point. 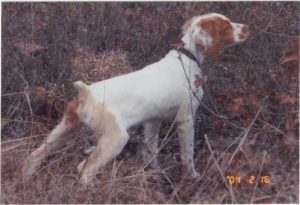 The last rooster we got is pictured here. He pointed it three times and finally pinned it. One of the hunters in our party walked around it and didn’t think it was there. 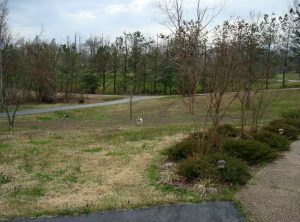 After he walked off, I believed the dog and flushed and killed the Rooster in the picture. The boots and vest Pete is wearing are required because he had hunted so hard that his belly and feet were shot over the three days. 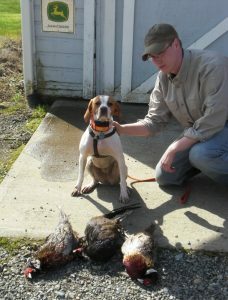 I couldn’t be happier with Pete as a family dog or a hunter! 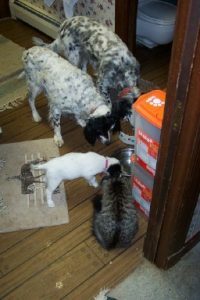 You might remember me, I got the last of a litter Llewellin female that had a lot of black on her two years ago. 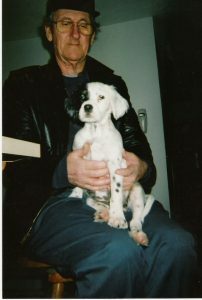 Lady is the best I have ever had in my life and I’m 63 years old. 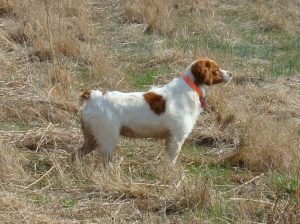 Lady hunts consistent and methodical, loves to please and has a nose that is unbelievable, she is careful and excellent in the field. 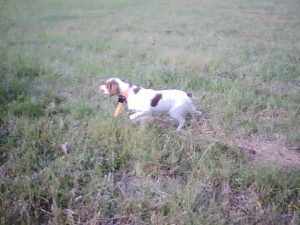 I continue to be well pleased, Lady learned how to handle pheasants in one day, she flushed the first one because she didn’t know how to handle them running, the second one she pulled back, circled way around, and headed it off and pointed it. I can teach her almost anything I want her to learn in just a matter of a few sessions. 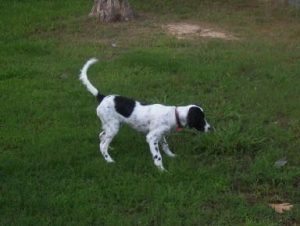 This is the most humble dog I have ever had and I have spent a lot of time with her, she is a constant companion in the yard while I am working outside and loves my wife and me and our grandchildren. What a dog! I’ll keep my faith, money, freedom, and guns. Hope everything is going well with you!! 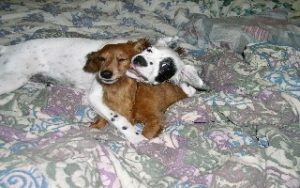 We thought you might enjoy seeing some photos of one of your pups. 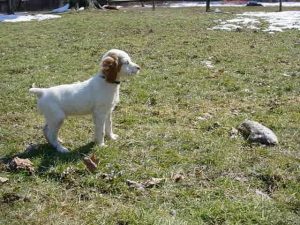 This is Brandy who belongs to Bruce Strom from Rockford, Ill. She has been here since early Sept. and is going to make a very fine gun dog. How are Buddy & Jeremy doing?? Let us hear from you! 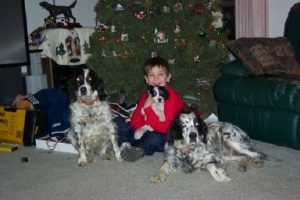 I wanted to shoot you an email and say how happy we are with the pup we got from you. He is now just over six months and is the fastest learning dog I’ve ever worked with. 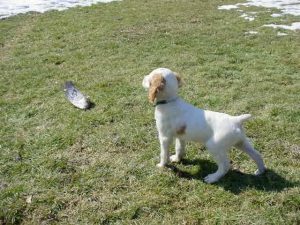 We named him “Highway Sage” and we call him “Sage” I began training him at ten weeks and actually took him wild chukar hunting at five months. 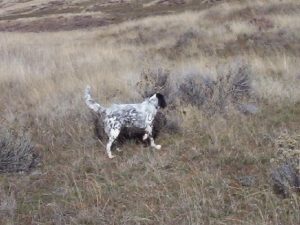 I thought he was going to be good for a couple hours on the Deschutes canyons keeping up with my friends 7 year old German Shorthair – but he lasted all day. 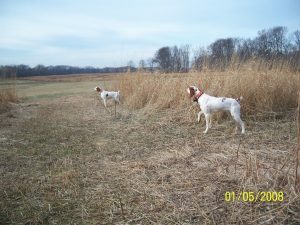 Sage did so well I took him two more times before the season ended – he did very well. 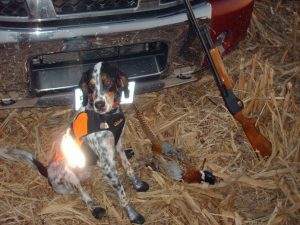 Sage continued to mature at six months old and did very well on a stocked chukar hunt – chasing one wounded bird three hundred yards to where it landed and then chasing the running bird down for another 50 yards. He was so proud of the bird he preferred to keep it to himself but eventually he decided to give up the goods for a bunch of praise. 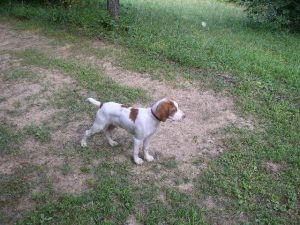 Just short of six months old I took him to some wide open country and had fifteen roosters released. 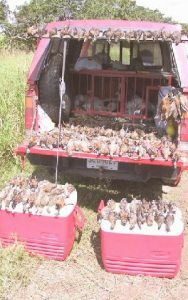 In retro-spec we wouldn’t have just let all of them fly from the bird box because these birds wanted to get out of Dodge. 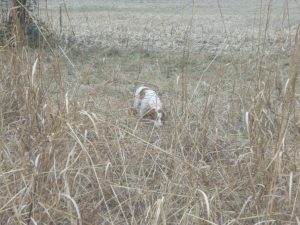 We spent all day tracking them down – it felt more like a wild rooster hunt than most wild pheasant hunts I’ve been on. 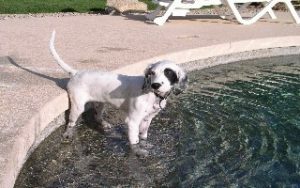 At just short of seven months old Sage blew our doors off. 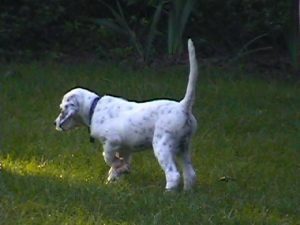 I’d have to say he performed almost as strong as the highly trained and very experienced German Shorthair. Considering he’s only seven months old and I’m still planning to give him a concentration of teaching over the summer and fall – I can’t wait to see how he works next year. 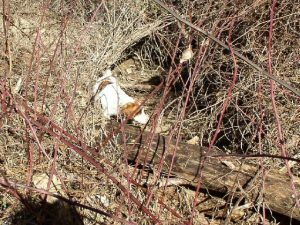 I included three shots of Sage on the pheasant hunt that I thought you might like to see. I have them sized for my computer so let me know if you have trouble viewing them. 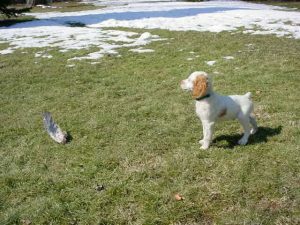 The first shot is Sage locked up on a pheasant – showing some nice style. 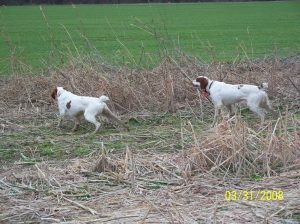 The second shot is the retrieve after the shot. The last picture was a real highlight. This was Sage’s first “honor point” performed all on his own. 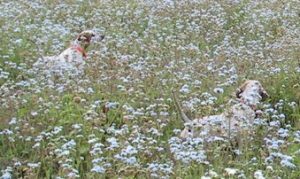 It was so cool that we didn’t move for about thirty seconds to let the dogs stay dialed in. 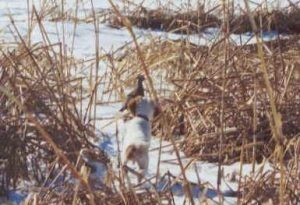 Unfortunately, the bird ran like a screamin’ banshee so we didn’t get a shot until later – but the dogs tracked the bird together – so it was pretty fun. 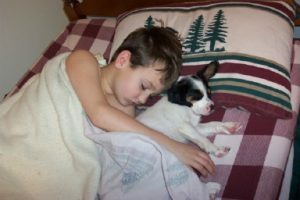 “Randy, I thought you might like to know how “Jake” is adjusting (my son named him). 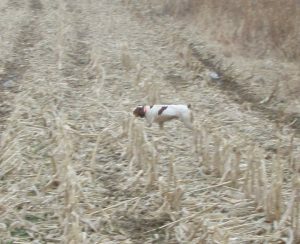 We went to field for the first time yesterday and he is a natural. After the first bird he was holding point long enough for me to flush. Not too bad for his first day in the field. 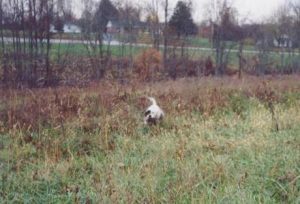 We didn’t lose a single bird (he found them all) but he isn’t quite ready to retrieve in the field yet. 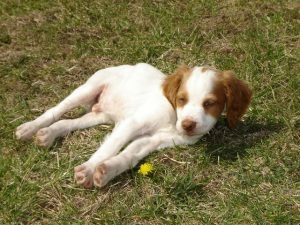 Once again thank you very much for helping us with the selection of the dog. I just realized the other night that I had not contacted you. 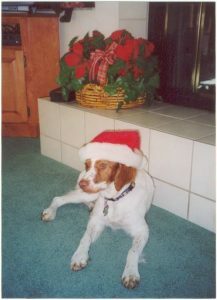 Back in Nov of 2006 we got our Angel dog from you. 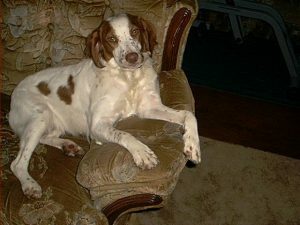 I never wrote to thank you so much for such a wonderful dog. 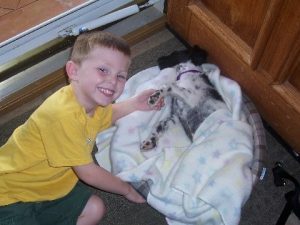 Ellie has brought a lot of joy and happiness to all she meets. She always puts a smile on your face. Duane’s father passed away a few years ago, leaving his mom alone and depressed. She now has (for a long time now) Ellie. 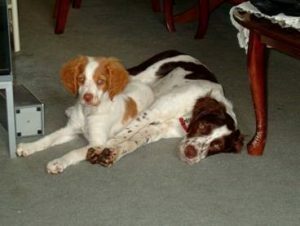 Every morning she comes over and picks Ellie up and they spend the day together, they go for car rides and walks (weather permitting) and then she is picked up and taken for her daily run or hunt depending on the time of year – she is really a God send. We live on the same block as an assisted living home and in the evenings we walk over and see the people sitting outside. 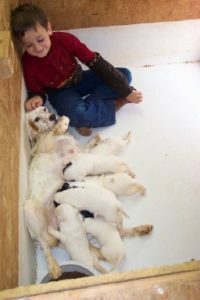 These people can no longer have their pets with them and Ellie puts big smiles on their faces. They pet her and talk about their pets, it is a very happy time for all. It is so nice knowing that we can make a little difference. 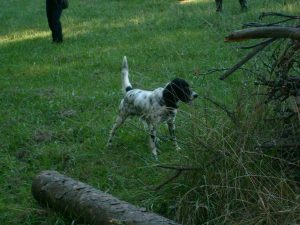 Sure we have had our little situations with her, we have lost her a couple of times – people have been very good about contacting us when they find her (thank goodness). All of course wished that they could have kept her. 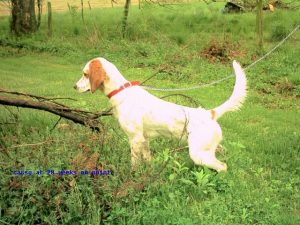 When she went to school for hunting at first the trainer was kind of leery of taking her – not thinking she would be able to do hunting. 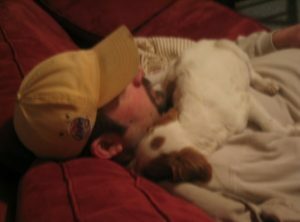 ( He is a very well known trainer) But by the time it came time to pick her up he had gotten pretty attached and was very sad to see her go. And she has turned out to be a wonderful hunter. 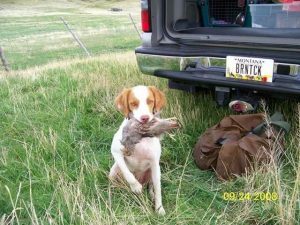 We have a membership to a hunt club so she can go a little longer than just the regular season. Words could never express the joy and happiness this member of our family has brought us and so many others. 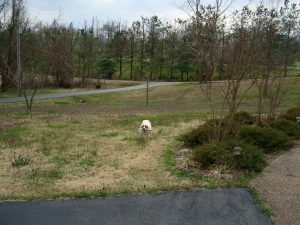 “I just thought I would drop you a note to let you know how Dutchess is doing. She is in excellent health and a wonderful companion. She graduated Saturday from an 8 week puppy training class at Pet Smart. 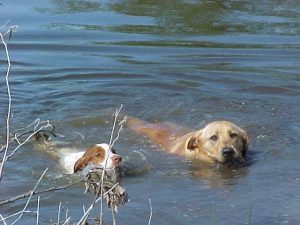 It was a weekly class for Dutchess and I to learn to work together with basic commands and such things. She did a fantastic job all through the classes. Very quick to learn with an unbelievable desire to please, with anything I showed her and asked her to perform. 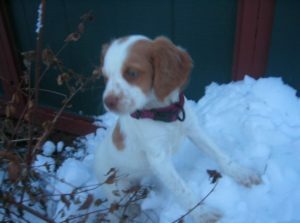 She is a beautiful little dog. 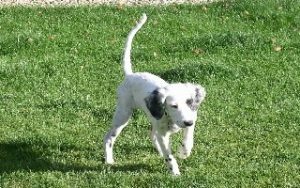 The training classes are conducted in the store and part of the training is negotiating all the sounds, the smells, other dogs and people. She is a hit whenever she is in the store. She just loves all the attention she gets. 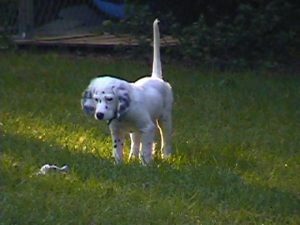 The instructor said a customer in the store told her he was getting a rare puppy that are hard to train but are great dogs. 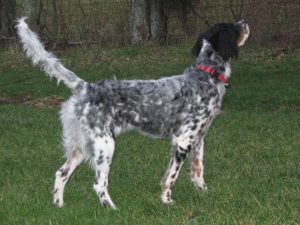 When he told her it was an English Setter she told him to come to our next class and see how well one does with training. 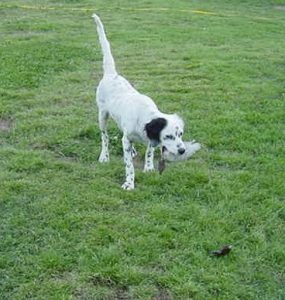 She demonstrates excellent manners with other dogs and with people. 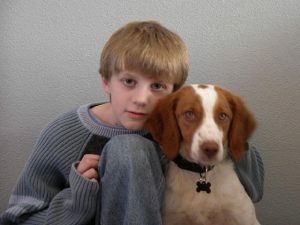 My one grandson is afraid of animals. No animal has ever bitten him or growled at him, but he was afraid. 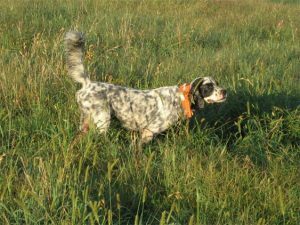 Since he has been around Dutchess on a regular basis he says she is the best dog ever and is becoming more comfortable playing with her and around other animals as well. It’s like she senses she needs to go a little slower around him so she doesn’t scare him. With the house training she is doing very good. To the point that when she has an accident you wonder what went wrong. Her last best stretch without an accident in the house was a little over 3 weeks (I happen to think that is fantastic for any puppy her age). 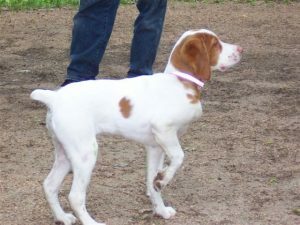 The other people in the puppy class couldn’t believe how well she was doing and were envious of her progress. With obedience to commands, her dog manners and house training. 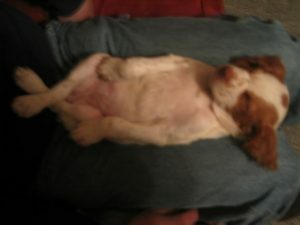 Just wanted to update you on my pup’s progress. He seems to have very good scenting ability and is very intelligent. 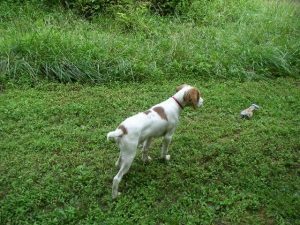 We are taking it kind of slow at this young age but he is already handling very well and locating birds with great intensity. 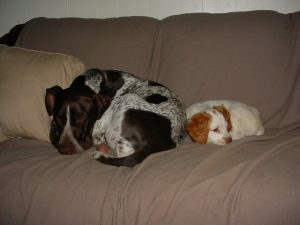 “Randy: Just wanted to give you an update on our pup, Lily. 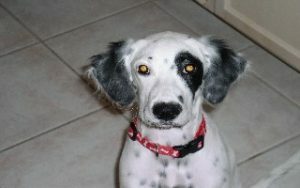 Its been just over a year since we picked her up from your kennel, out of the Highway Dan/Twincedar Annie litter. 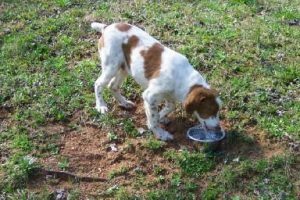 Since then, we’ve sent her to Dr. Fortner for training … we dropped her off in late August and picked her up in early November. He was quite impressed with her, and commented on how easy she was to train. 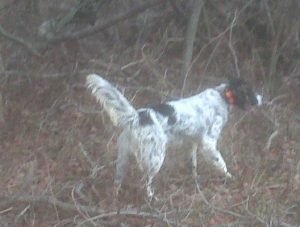 Various issues prevented me from actually hunting her until this month, but you would never know it from the way she performs. She is a fabulous hunter. 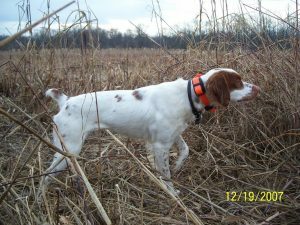 Her nose is unbelievable; she often points birds 20-25 yards away — quite an accomplishment for a 15 month old pup! Her style is amazing, and as you can see from the pictures, she is incredibly intense. Throw on top of that what a great pet she is, and I cannot tell you how pleased and excited we are to have her. 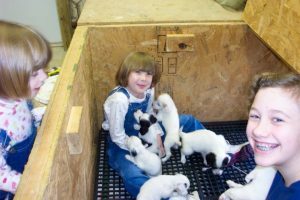 I cannot tell you enough what a great operation you have, and how good the dogs you produce are. 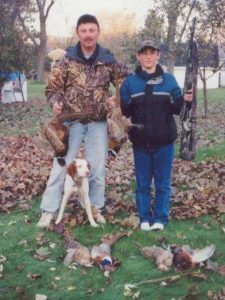 They are not just great hunters, they are great family members too. 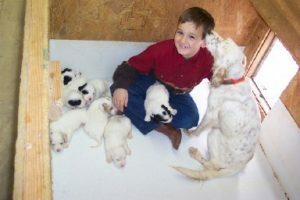 I guarantee that I will be back in a few years to pick out another pup so I can have a couple of hunters! 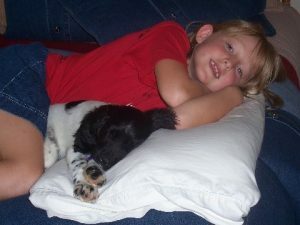 Thanks again for allowing us to have this wonderful dog. 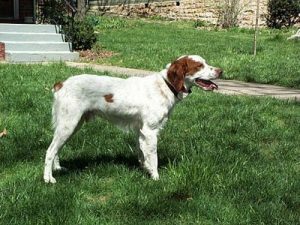 Just a quick note to let you know that the setter pup (Gypsy) I got from you is doing unbelievable work for a 9 month old dog. Great finds, solid points held to wing and so far no creeping on running birds. She backs and honors like a finished 4yr old. 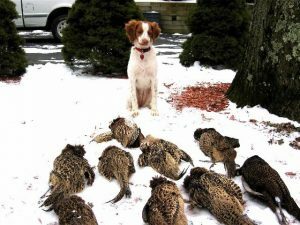 She will fetch every bird she can get to first, but I can call her off if necessary. 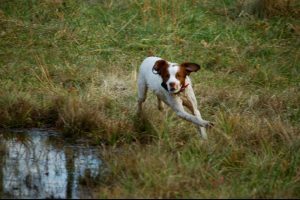 She does like to run around a bit before retrieving but I’m not complaining. 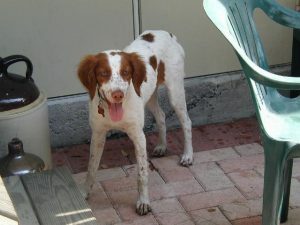 She has a great personality around the house and has had no issues with other dogs. 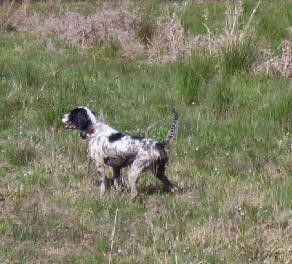 Up ‘til now she has worked on pigeons, quail and chucker. 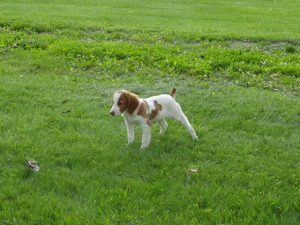 Next week she graduates to pheasant and I am now planning to take her to South Dakota for some wild birds in November. Believe me, I did not expect to have her to this point for another year. This pup is making me look like a much better trainer than I am. 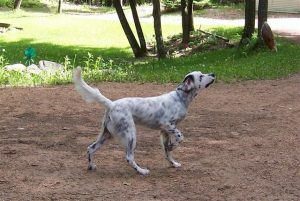 It is just amazing what natural abilities a dog can be born with. 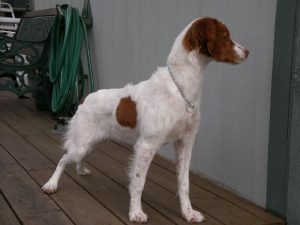 You are to be congratulated for breeding such a fine dog. 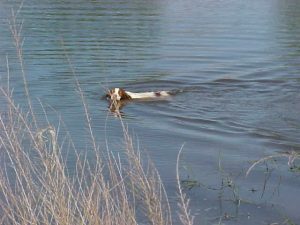 I even started working her on blind retrieves, we’ll have to see about this but I figured there must be something I have to actually train her to do. Just a note to bring you up to date on Brandi…she had a great “first season”. 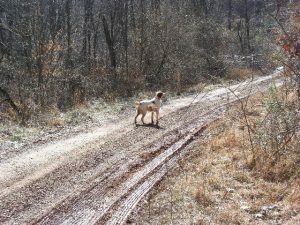 She went with me to Montana, North Dakota, South Dakota, Montana, New Mexico and here in TN…she is well traveled. 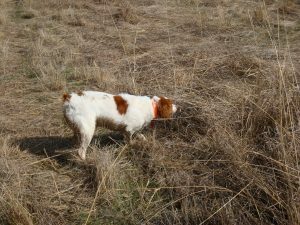 She found here share of birds all the way and I really think she works pheasant better than my old dog. 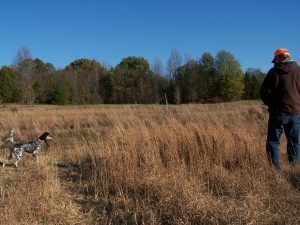 The last day of the season here in TN she found a covey and held her point until I could get into position (at least 5 minutes) to shoot. I had to go back about 50 yards, cross a creek and then come back and get down in the creek to flush the birds. But I got a bird! She also made one of the few points we got on singles in New Mexico. 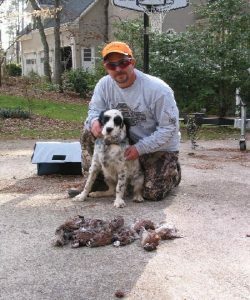 I took her to a hunting preserve last week and she found all the birds that were released and retrieved. 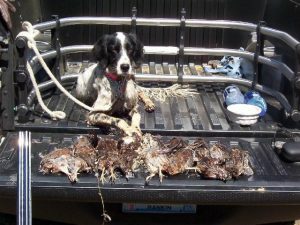 But the most impressive thing was she made 2 very long retrieves. One bird I flushed 3 times without getting a shot and the third time she followed it until it came down and brought it to me. 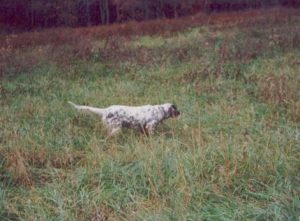 The other I got a piece of and it flew about a 100 yards and again she followed and brought it back. Another bird flushed and she saw it (it didn’t fly but a few yards) she pointed and held her point until I could get to her and I flushed the bird… IMPRESSIVE! 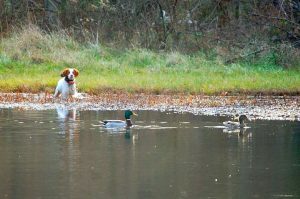 “Randy, Pete out for a run…loves to chase ducks until he has to swim then it’s easier to run on shore. Birdy you bet. 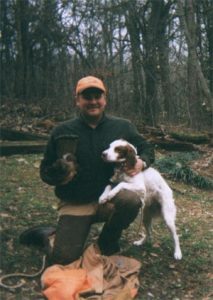 I have hunted Pete on Ruffed Grouse in No. Wisconsin. 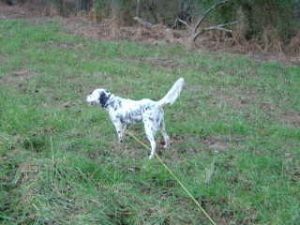 Ran circles around the GSP he hunted with. 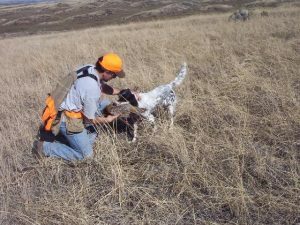 Grouse hunting is very similiar to brush busting rabbit hunting. Pete is fearless… Maybe too much he and porcupine met this year. 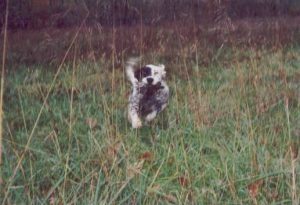 Mouthful of quills for Pete, (Vet said calmest dog she ever dequilled), oh yeah porcupine died of lead poisioning! 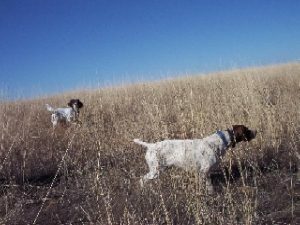 I hunt Pete on quail, chuckar, and phesants. House dog, you bet. Good with kids. 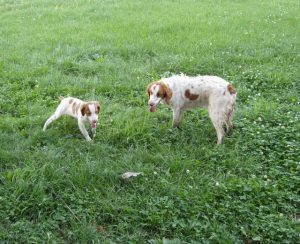 Folks if you are looking for great dogs don’t look to the right or left… Travel to the micropolitan town of Wingo Ky.
Make sure you only take with you enough money to buy one dog…you will be apt to take home multiples. 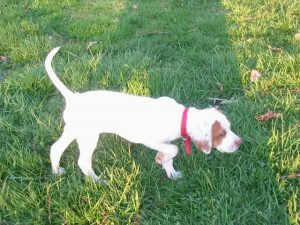 Randy will spend as much time with you as you need picking out the pefect pup for you. 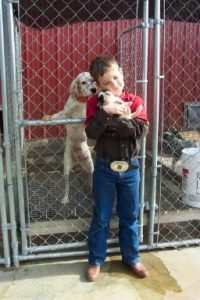 Kennels are clean, well ordered, and a class act all around. Yep I have two of his wonderful Brits! arthritic. I wouldn’t take a million dollars for that pup. 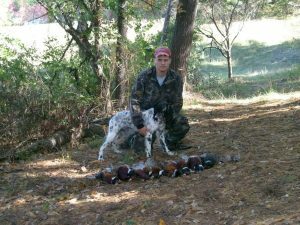 Flushed 9 birds that day, only three from a point. They were all Tucker’s points. We hope all is well in Wingo! 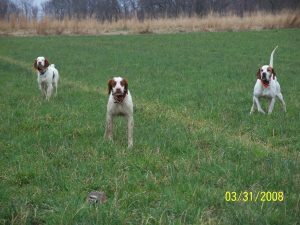 Great looking bunch of pups you have on the web site. 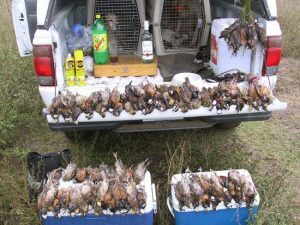 We have just finished up another grouse season in West Virginia. 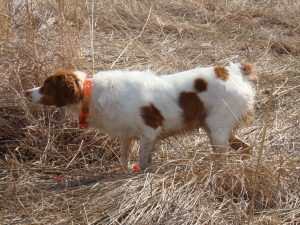 The flush rates were similar to last year. We averaged around 1 flush/hr. 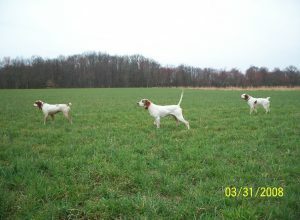 in three of the four counties we hunted. Half that in the other. My shooting percentage went up, I blame Tucker for that. 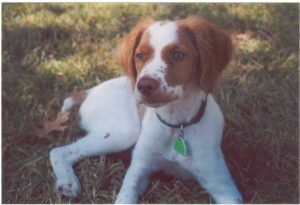 Tucker will be four years old at the end of this month. 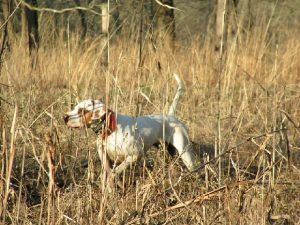 We speculated after his first year that he just might make a bird dog. He has and is. In my opinion anyway, and for Tucker, the only one that matters. 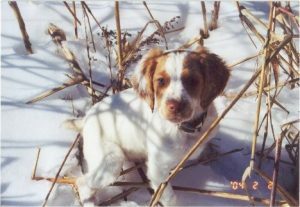 I have been huntin’ with dogs ever since I was a pup. 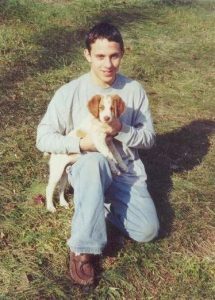 Dad always had Beagles, coonhounds and foxhounds, and we had a “ton of fun” with them. 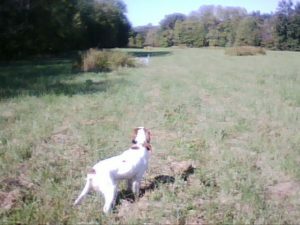 But, I can’t ever remember having more fun than I am right now huntin’ grouse with Tucker. He knows his job and loves it. I’m confident in him, and I have learned to never question that nose of his. He sure makes it easier for me to hold up my end of the deal. I’ve told you I’m not a trainer, I’ve just turned him loose and followed him. He has figured the game out on his own. Thank you.